Camping is a wonderful adventure, unless you are riddled with bugs, cold, wet or hungry. So here are some easy tips to ensure that your camping trip is a bug-free, comfy walk in the park! Just because you’re playing in the dirt, doesn’t mean you can’t be living in the lap of luxury. Make friends and influence people with your camping savvy and great camping gear! 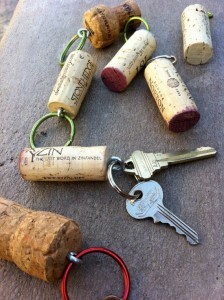 Use wire to attach a cork to your keys so they will float if you drop them in the drink. Papa’s got a brand new bag: Use a large Ziploc bag or (if you’re me) put some air into the bag of wine you brought with you and use as a comfy pillow. Wine bags double as a handy flotation device. Frisbees: These offer amazing support for paper plates and make great water bowls for dogs. 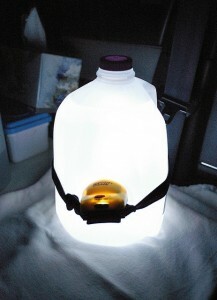 Wrap your headlamp around a clear water bottle to help diffuse the light in your tent. Learn more. Tick Tac boxes: Great for storing spices and keeping matches dry. You can also dip the ends of your matches in wax or clear nail polish to make them waterproof. Pack pancake mix into Ziploc bags. When you ready to make them, add water, seal the bag and knead to mix. Then just cut the bottom corner off the bag and pipe the mixture into your pan. Got a splinter? Place a small piece of banana peel onto the affected area and cover with a Band Aid. The splinter will dissolve after a day or two. Dirty plates or pots? Use sand to scour the worst of the dirt off and absorb the grease then rinse and wash.
Use a lint roller when you come back from a hike to get all the ticks off. 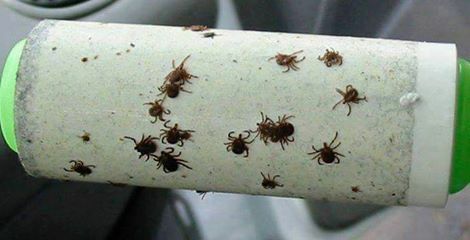 You can also make your own natural tick repellent that will prevent them from coming near you or your pets. Get the recipe here. Need fire lighters? Doritos chips or crayons will burn for a couple of minutes and will act as great fire lighters. Toss some sage or sweetgrass into your campfire to keep the mosquitoes at bay. Freeze water in water bottles to keep food cool over the first couple of days and for drinking towards the end of your trip. 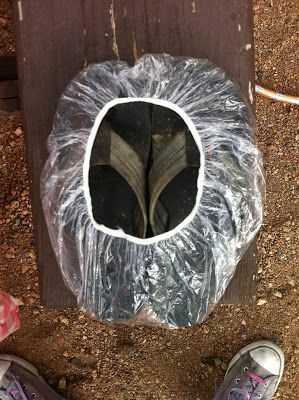 Use a plastic shower cap to put your camp shoes in so they don’t dirty your clothing and pack. Substitute your tent pegs for solar lights to shed some light on your campsite and this prevents you from tripping over guide ropes. Take out the inner cardboard tube from your toilet paper, squish it flat and keep in a Ziploc bag to ensure that it stays dry. 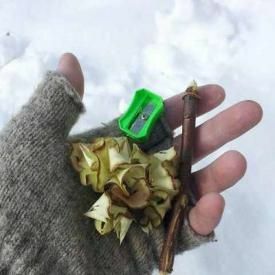 Use birch bark as a fire lighter as it contains volatile oils which burn easily. Don’t peel the bark off trees as this will damage them. Take a pencil sharpener with you to make the perfect kindle. Making a cooking fire? You can make a ring of stones around the main fire and then a channel with parallel rows of stones coming off one side of your stone fire circle. This is your cooking area. Use a stick to scrape your coals over to the cooking channel. This means you can continue to generate hot coals in your fire and move them over to the cooking area when you need them. This helps you to regulate the temperature and you won’t get caught with a dying fire and an uncooked dinner. You’ll need a good camping hatchet to chop firewood. A good axe or hatchet is essential if you want to build a fire and can come in handy if you are in a survival situation.If you are looking to buy one, check out this guide to hatchets for camping and other outdoor activities. Relieve itchy mosquito bites with toothpaste. 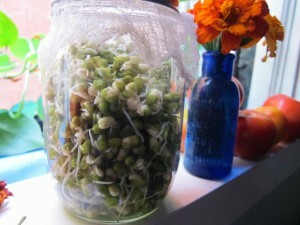 Sprouts: Punch a couple of holes in the lid of a Mason Jar. Add 1/3 cup lentils and 2 cups water. Leave for 24 hours and drain water. Rinse lentils twice a day and drain. In 48 hours, you will have super fresh sprouts! Make your own bug spray with natural ingredients. Find recipe here. If you’re thinking of buying your own tent, but not sure where to start, check out this guide for a good overview of the options available. If you are into bringing your guitar for campfire jam session, make sure you learn some quick songs. These sites about learning guitar by GuitarFella could prove useful. Get our amazing campfire cookbook The Flaming Marshmallow’s Guide to Campfire Cooking here. Really useful tips before any camping trips. I’ve got problems with mosquitoes and ticks, will apply these tips soon!